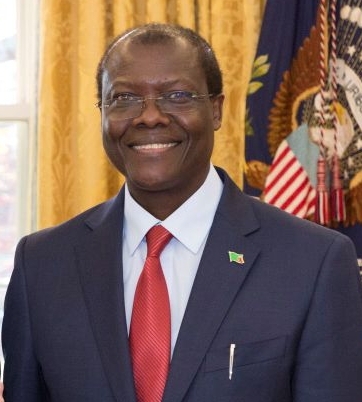 ﻿ Ambassador Dr. Ngosa Simbyakula's Biography | Embassy of the Republic of Zambia in Washington, D.C.
Dr. Ngosa Simbyakula is the 16th Ambassador of the Republic of Zambia to the United States of America since November, 2017. He is also concurrently accredited, on a non-residential basis to Mexico, Nicaragua, Costa Rica, Belize, Haiti, Guatemala and Honduras. Before taking up this appointment, Ambassador Simbyakula served as a Member of Parliament from 2011 to 2016. During this period, he was appointed Deputy Minister of Justice and later elevated to Cabinet Minister for Home Affairs by President Michael Sata in 2013. In 2015, President Edgar Lungu appointed him Minister of Justice, a position he held until 2016. Dr. Simbyakula has spent most of his working life in academia. He has taught in the faculty of law at the University of Zambia since 1981 where he rose to the position of Dean of the School of Law from 1993 to 1998. During this period he also served as external examiner at the university of Dar-es-salaam from 1996 to 1997. In 1998, Ambassador Simbyakula was appointed Permanent Secretary for the Copperbelt Province by President Frederick Chiluba who later in 1999 transferred him to the Ministry of Foreign Affairs in the same capacity. In 2002 Ambassador Simbyakula was appointed Permanent Secretary at the Ministry of Justice by President Levy Mwanawasa. From 2006 to 2009 Ambassador Simbyakula served as CEO of the Zambia Institute for Advanced Legal Education, an institution which provides a one year postgraduate training and sets Bar examinations for law graduates who seek admission to the Zambian Bar. Ambassador Simbyakula has previously also served as Vice Chairman of the Tax Appeals Tribunal, from 2004 to 2010 where he heard and adjudicated on tax appeals from taxpayers against decisions of the Zambia Revenue Authority. Ambassador Simbyakula is a graduate of the University of Zambia where he obtained his LL.B. He also holds an LL.M specializing in constitutional law. From 1986 to 1990 Ambassador Simbyakula was a fulbright Scholar at the University of Wisconsin-Madison where he earned his SJD with specialization in taxation.